Of course, one of the first things the Brady administration did in high schools is get rid of block scheduling, in most of the small schools this year and Hope next year. It is a little unclear what the real motivation is. It will save money. Apparently they also think that if everyone has the same schedule it will be easier to take things like AP classes in other buildings. Regardless, it flies in the face of what was working in Providence. You don't need any fancy statistical analysis to see the pattern. 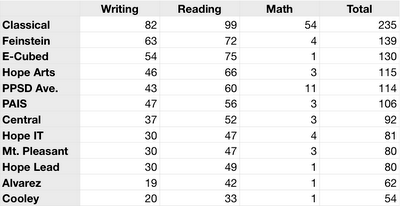 Note - I omitted Hope Leadership because they don't belong in the "testing year" data, which is what I used. They didn't exist in the "testing year."